Where there's an Injustice: Gods Among Us combo video, there's Maximilian to provide a day one combo video. Head inside to see some early Martian Manhunter combos. 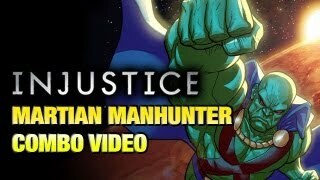 Maximilian has posted day one Martian Manhunter combos for Injustice: Gods Among Us. At the end of the video, Max promised a "WEEK OF!" Martian Manhunter. For those new to the series, Max plans to take the DLC character online for a week in either ranked or player matches.